4 Likes jrobinson, springer, KevinB and merc16 like this. Didn’t like the 14/49 gearing ... took too much away from the street manners. So today I installed a 46T rear. Changed out the sprocket bolts and nuts for a harder metal, since the OEM nuts were getting a little rounded on the corners. 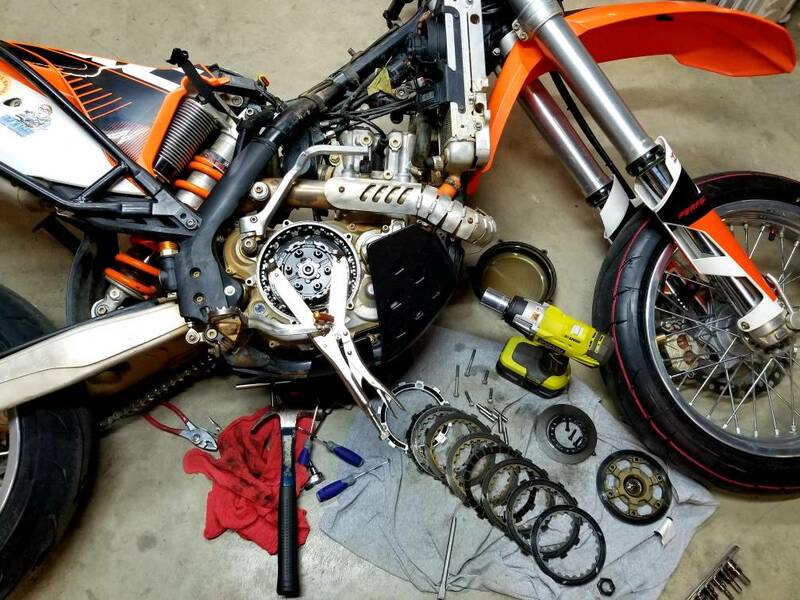 Had to remove four links since the 114 chain was at the limit of the axle blocks, and 112 is a multiple of 14. Also changed the oil and filter. Then went for a little ride around town. Next I’ll tackle the IMS 4.7g tank install. Big tank installed. Got it done in about two hours, taking my time. 2 Likes klaviator and merc16 like this. Replaced the clutch dampers on the 450 today. They were definitely due for replacement...there's not supposed to be any play. 4 Likes Chitza, springer, merc16 and Nice Goat like this. Replaced the stock muffler with a titanium one. I wasn't looking to replace the OEM muffler, but I found this one used for too good of a deal on one of the FB Africa Twin owner's pages...I couldn't afford NOT to buy it. It's not really any louder than stock, and the dyno graph only shows about a 2hp increase...but any weight shed from this beast helps. 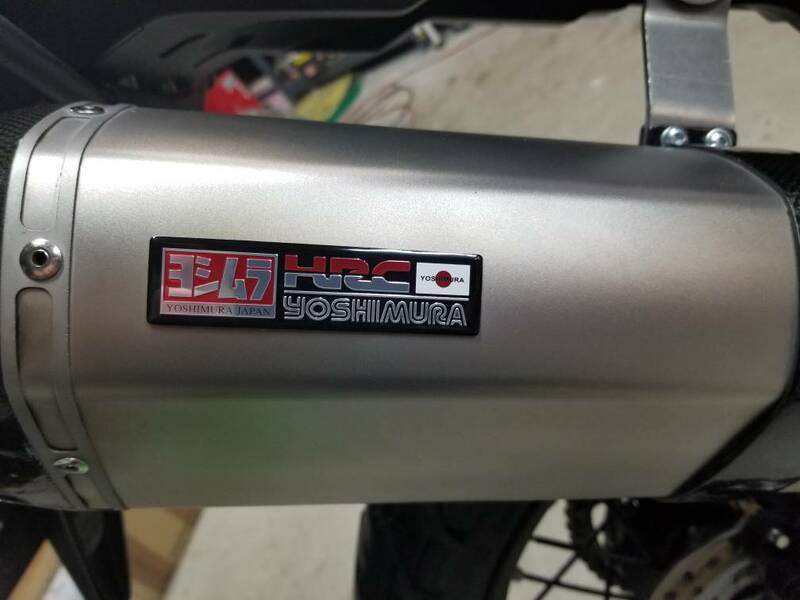 It's made by Laser, but came unmarked...a couple of minutes and $2.99 on Ebay yielded a Taiwanese made aluminum emblem that turns it into a factory Yoshimura/HRC racing exhaust. I think I'm also gonna leave the pannier racks off and run it in secsay mode for awhile. 3 Likes yamahamer, norton73 and gulfcoaster like this. i gotta get some them stickers ! MO HP ! Finally installed my Seat Concepts kit. 3 Likes Chitza, springer and klaviator like this. Installed an Abrams emergency red LED beacon as an auxiliary brake light. 2 Likes Chitza and springer like this. Now to pick what tires to run. 3 Likes Chitza, springer and gulfcoaster like this. Replaced the broken plastic from the last trip to the Ridge. I’ll find out tomorrow if my wiring is ok. Looks tidy, even if it don’t work. The Husky needed to gain 11oz's.